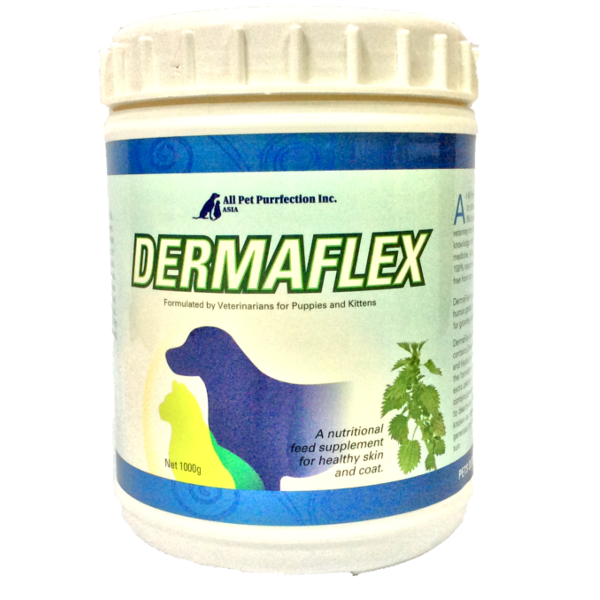 DermaFlex is a powerful, synergistic blend of human grade, natural ingredients formulated for growing puppies and kittens. DermaFlex is a unique, multi-tiered system, it contains Omega fatty acids ( Omega – 3, Omega – 6, Omega – 9 ) and Hyaluronic acid (HA) that are essential for the formation of healthy cell membranes and extra cellular matrix for healthy skin, it also contains powerful antioxidants that are designed to deactivate a specific type of free radical known as singlet oxygen, the one that is generated by ionising radiation of the Sun. It includes a blend of herbs and nucleic acids noted for their ability to stimulate gastric secretions and facilitating the uptake of essential nutrients in the intestinal tract and their unrestricted availability for every multiplying cell, and a variety of other components designed to support the growth of the natural commensal bacteria of the gastrointestinal tract. These natural ingredients also serve as a source of natural vitamins, minerals, enzymes, carbohydrates, protein, chlorophyll, and fibre to support the health of the skin and coat. Essential fatty acids ( Omega 3, 6, & 9 ), Carotenoids ( alpha-carotene, beta-carotene ), Phyto-hyaluronic acid, Purified RNA, Purified Nucleoides, With a proprietary blend of nutraceuticals of Pancreatin 8x, fennel seed, colostrum, alfafa, stevia leaf, fenugreek seed, rosehips, nettle, milk thistle, dandelion root, papaya leaf, ginger root, blessed thistle, green tea extract, stablised yeast extract, beta-gluconase, bromelian and papain. Palatability enchancer, tocopherol, tocotrienols, squalene and lycopene.